I had a day off work today. Yay! However, on working days, I drink more water, I eat more consistently, and it's easier to stay on plan. Today my plans included getting a massage, checking out an organic market with a friend, and getting a haircut, in that order. I had those plans down pat but what I didn't plan was food. How is it that after about 3 cumulative years on Weight Watchers I don't have the "planning" aspect down yet?? My first mistake: I got up and and enjoyed two cups of coffee while watching Grey's Anatomy from the night before and just lost track of time. Before you know it, I'm scrambling around 15 minutes before I have to leave getting myself ready and trying to find something filling, enjoyable, and fast to eat. I made my latest favorite wrap. Ridiculously delicious. Then I took off for my appointment. Following my wonderful massage was where I made my second mistake. I should have grabbed a granola bar or a yogurt or something and tossed it in my bag. Even a bottle of water would have been great!! I went straight to my friend's place to go to the market. As soon as we came back from the market, it was time for me to get across town to my hair appointment. Now it's been 5 hours since I've eaten and I am stomach-growling hungry and a little bit angry about it. I had to stop for gas, so there I am wandering around the tiny convenience store picking up and putting back chocolate bars and chips over and over. Finally, I leave with just the gas and a Coke Zero. Why didn't I just get water?? Then I'm driving in rush hour past every fast food restaurant that exists and suddenly wanting a burger badly, trying to convince myself that I deserve it. It's then, in the car on the way that I realize that I still have my purchases from the market. 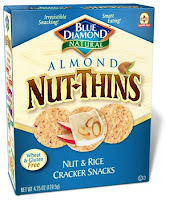 In that box were some Blue Diamond Nut-Thins crackers and a small container of hummus. At the next red light, I checked the nutritional info, counted out my 16 crackers and ripped open that container of hummus. Oh, and I now have two new loves and their names are Hummus & Nut-Thins. I digress. The crackers, hummus and coke zero hit the spot long enough for me to get my haircut and get home to prepare a regular supper. As I was preparing supper, I started thinking about how it could have turned out differently. I could have hit a drive-thru and ordered a big combo meal and polished it off without even thinking about it. When I was in the gas station looking at the candy and chips, I made a choice. With every fast food restaurant I drove past, I made a choice. With every 7-Eleven and Mac's I drove past, I made a choice. On their own, those choices seem so small but put them all together and it's a lifestyle choice. A million little choices got me to where I am now and a million little choices will get me back to where I need to be. Those little choices don't seem so little all of a sudden. Great job for passing on those unhealthy choices! Side note: My husband ordered Chinese food the other night (I passed and had something healthy! ), and I just opened 1 of the 4 fortune cookies that were on the counter (I threw the cookie away!). It said, "Life is a series of choices. Today yours are good ones." Then, I read your post. It’s really true that we are the only ones that can decide how this journey turns out. All these healthy little choices we make will eventually add up. Good job Amanda! That is the most perfect fortune to get in a cookie! 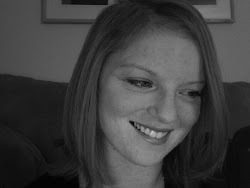 I love your blog and I'm following. Hope you visit me soon. Thanks for visiting my blog! I'm trying to catch up on yours, and am loving the post from August 31, where you quoted "The Office!" I'm happy to get to know you here. Oh, and on a side note, your hair is fantastic. I'm so jealous. So very true! About staying on track when you have a day off (a.k.a Corporate Monday) and also about all the little choices that add up to make the big picture. Keep up the willpower...you're doing it!